Dieci says its new Cotton Pro telehandler is the result of an in-depth survey which lead to the refinement of its standard offering in order to resolve all the specific environmental and product issues of the cotton industry. 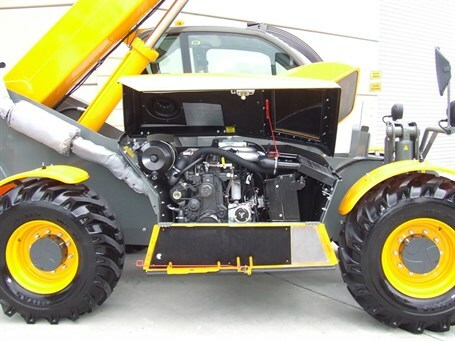 "We’ve added full plating to protect the drive shafts and under body moving parts of the telehandler from fibre penetration," says Dieci Australia executive chairman Paul Jenkins. "For the same purpose the alternation is wrapped in a special protective sock." Given fire can be a real risk, Jenkins adds the complete exhaust and turbocharger heat element systems are encased in a fibre proof blanket wrap to ensure total protection. "The harsh and hot conditions in the middle of the cotton belt are addressed on two fronts — both to protect the machine and provide comfort for the operator," Jenkins says. "Beginning with the machine itself, a special radiator is installed which has only five fins per inch with an in-line tube configuration. "This enables the best chance for foreign objects to pass through the radiator without clogging the cooling elements." To enhance this effect a hydraulic reversing fan is installed, allowing a reverse flow of air to be activated through the radiator core to clean out of any debris that may accidently be caught. A protective clean air bonnet intake is fitted above the air intake with a piece of fine stainless steel mesh facing downwards. "This ensures that firstly, any loose waste falling from the lifting forks can’t enter the engine air intake and automatically clears any debris collected there as it drops away when the machine is stopped." An independent hydraulic oil cooler is installed outside the engine bay with its own independent cooling fans to ensure this critical component of the system is kept at optimum temperature. The unit also features an automatic temperature and shut down monitor to fully protect the machine, pumps and engine in the event of any system component moving outside specification. Dieci’s Generation 3 space cabin offers excellent visibility, comfortable pneumatic seating, and an ergonomic joystick. Jenkins says the air-conditioning system is also greatly improved to meet the demands of the Australian summer. The condenser unit itself is fitted with special reversing fans which automatically change direction every 20 minutes to avoid any blockage of this component. This is enhanced by the standard plastic cover being replaced by a new custom-modelled version utilising fine stainless steel to limit the ingress of any foreign matter. Inside the engine bay standard fuses and relays have been replaced with marine grade circuit breakers and solenoids to further guarantee reliability in the harshest conditions. The electrical system also boasts a large 120 amp battery and a remote battery isolation cut-off switch. "The engine bay has best of class access for servicing with both a large bonnet that raises well out of the way and a full drop-down side," Jenkins says. "These combined provide unparalleled access to the engine along with all the pumps and hydraulics. "Finally, the actual pick-up working end of the boom includes a fully integrated side shift for accuracy and a specialised set of cotton forks to easily handle to 2m diameter bales." "The Cotton Pro is a true 7-tonne machine on rubber with fully integrated Australian Standards load charts at 600mm load centres," he says. "The ability to pick up the large 2m bales with full stability is unmatched by competitors in this range of machinery." Dieci Telehandlers are marketed in Australia by the AWD Group which specialises in capital equipment sales and service nationally.